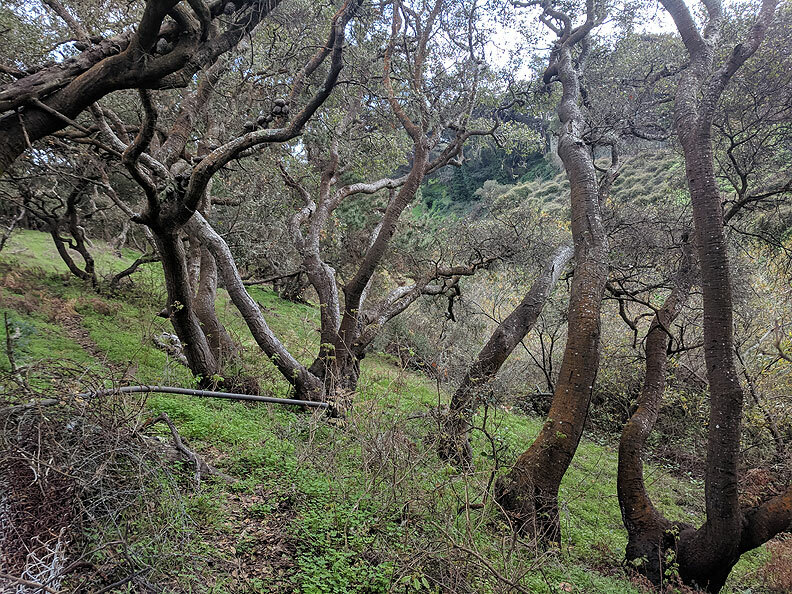 Coast live oaks thriving alongside Lobos Creek in the Presidio, January 2019. 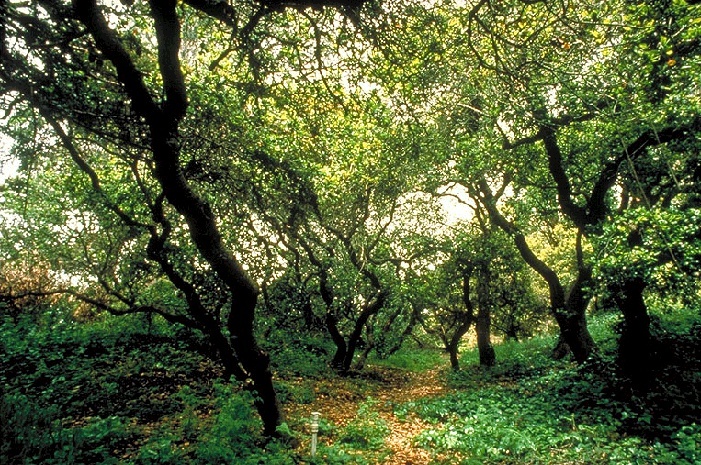 As the most abundant oak in early San Francisco, the coast live oak was among the most important sources of food for the Ohlone Indians. Acorns, whether roasted or ground into meal, provided high-protein calories year-round and were especially important during winter and other times of scarcity. Some Ohlone tribes used a decoction of its bark and insect galls for toothaches and leachwater from acorns for diarrhea. Its wood was also highly prized for utensils, including mortars and bowls. Controlled fires, set only when the conditions were just right, would keep shrubs from encroaching on the oaks and inhibiting oak regeneration. Regular fires would keep fuel loads low, thus reducing the risk of a catastrophic fire that could spread into the canopy and destroy an entire grove. Set at the right time, fires helped prevent outbreaks of weevils and other pests of acorns that spend part of their lifecycle in leaf litter. Most oaks in California survived this type of fire management because of their ability to resprout, and coast live oaks, with the thickest bark of all the oaks, are the most resistant to fire damage. Heavily used by Europeans for firewood, most of the city's groves of coast live oaks were cut down during the early years of the city. The arroyos above Lake Merced were once covered in oaks, but only a few survive. Most other streams were lined with oaks and willows, but only Lobos Creek still features substantial numbers of oaks. Another important remnant oak grove is in Golden Gate Park behind the Conservatory of Flowers. The Golden Gate National Recreation Area and the San Francisco Recreation and Park Department are helping restore oak habitat in the Presidio, Golden Gate Park, and Buena Vista Park by removing invasive plants and planting acorns. Coast live oaks in remnant grove in Golden Gate Park.